A trip on public transport or to the local coffee shop might give the impression that touchscreens are everywhere, but scientists at Autodesk Research of the University of Alberta and the University of Toronto are looking to take the ubiquity of touch interfaces to the next level. They are developing a “Magic Finger” that allows any surface to detect touch input by shifting the touch technology from the surface to the wearer’s finger. Magic Finger doesn’t look like much at the moment. In fact, with its LED light it looks a bit like a child’s attempt at an ET costume prop. 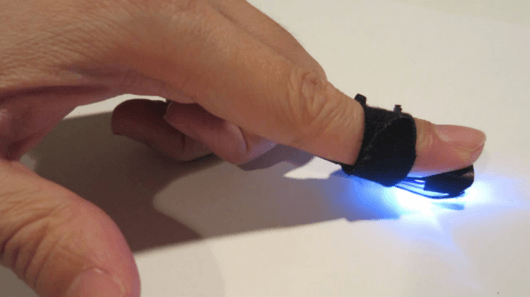 It’s a proof-of-concept prototype made up of a little Velcro ring that straps to the wearer’s fingertip with a trail of wires leading to a box of electronics. But what it does blurs the line between the digital and real world. On the ring there are a pair of optical sensors. One is a low resolution, high-speed sensor for tracking movement, which wouldn’t be very impressive because it makes the device just a mouse you strap to your finger. However, Magic Finger adds a new dimension with a high-resolution camera, which is able to detect 32 different surface textures with 98 percent accuracy. This allows Magic Finger to recognize what it touches, such as leather bag or a table or a magazine page, and with this information turn various surfaces into interfaces for devices or a way of passing information. Programmed to the wearer’s personal preferences, the Magic Finger can make non-digital objects into digital interfaces. An annoying smartphone ringing can be muted by touching the bag that it’s in. The wearer can start an app or send a saved text message by touching a logo on their shirt. Pinch commands and other gestures can be used for tablet or computer control without actually touching the device, and information can be passed to a receiving device by touching it. Another twist on the Magic Finger concept is its ability to detect “artificial” textures.